In a bowl, mix flour, wine, and water roughly, cover it with plastic and keep for 12 hours in the fridge (autolyse). Add sourdough starter and mix by folding dough in the bowl. Add cranberries and mix by folding dough in the bowl. Add salt and slap & fold for 3 – 4 minutes or until the dough becomes a ball. Bulk fermentation at room temperature, folding the dough every half and hour until it develops enough strength (I did 4 sets of folds). Let it rise until the dough starts showing the yeast activity. It takes about 6 hours total depending on the temperature of your kitchen (I used my bread proofing box set at 78 F). Shape the bread as a boule (or 2 baguettes), place in a banetton or other appropriate container, and let it proof in the fridge for 16 to 18 hours. Pull it out of the fridge and leave it out for one to three hours (see comments). Slash the bread and bake in a 450F oven with initial steam for a total of 40 minutes (for a boule), or 20 to 25 minutes for baguettes. Comments: Preparing this bread had me worried up until the point I finally sliced it. Something seemed terribly wrong, as I detected very little fermentation, even though I kept the dough for almost 7 hours at 78 F. The original recipe called for retarding the dough in the fridge and shaping it next day, but my dough seemed so…. slow! I decided to shape it on the same day, and retard the dough in its final form, ready for the oven. Ideally, you should remove the bread from the fridge and allow it to almost double in size. That was not happening, so after a couple of hours I simply had to bake it. Now, a little tangent. I usually wake up several times during the night, and tend to think about our experiments while trying to go back to sleep. Sometimes (unfortunately not that often), when I wake up again an hour or so later, I have a new idea to solve a problem or at least approach it. Almost as if during my sleep something goes to work “behind my back”… 😉 That Saturday night, I went to bed thinking about the red wine sourdough and why it seemed so weak. Exactly at 2am I woke up with one word blinking in my mind: SULFITES! All wine these days is preserved with sulfites! Maybe some batches have a higher concentration, maybe some of the bacteria or yeast in my starter was particularly sensitive to it. At any rate, one thing is certain: when you add red wine to make the dough the pH will be lower (higher acidity) so that will affect the efficiency of fermentation. Add to that the sulfites, and things can get trickier. Discussing these points in The Fresh Loaf forum, one of the bakers mentioned that when he adds wine to the dough the crumb of his bread gets tighter (indicating lower production of gas). For that reason, he normally tweaks his recipes to lower the alcohol and increase the water. Since in this case we are hoping for a nice red tint in the crumb, compromise is in order. I’d say keep the recipe as it is, and see how your starter behaves with it. Just for fun, I’ll try to find an organic red wine for my next “experiment”. Organic wines cannot have extra sulfites added, so the levels of the chemical will be low, ranging from 10 to 20 ppm (parts per million). Non-organic red wines often reach 125 ppm of sulfites or higher. Even if the fermentation was not at its peak, this bread was delicious! I love the slightly sweetness given by the cranberries. My favorite match for the bread was a Maytag blue cheese, sharp and salty. Next day, slightly toasted, it seemed even better! That bread is beautiful. Is the wine primarily for color or does it add to the flavor as well? I’ve been thinking of adding dried cranberries, orange zest, and walnuts to my next batch of whole wheat. When I was in practice I used to figure things out while I was sleeping all the time – another thing we have in common! Oh my all of my favorite things in one bread? Love your photography! Your subconscious at work! All the ph stuff speaks to me and a lot of your science knowledge as well! That’s why I always liked you dear Sally. You are too sweet! So great to see you here…. makes me smile! So glad to be here, you are an amazing woman Sally! People NEED to smile more. Oui? Gorgeous, just stunning, Sally. I’d like to know, too, if the wine added flavor. I’m guessing that it did. See my reply to CIndy, Marcia… it does add flavor for sure, but it’s subtle. I’ve been wanting to see this since you mentioned it. What a beautiful loaf. I just love the color. I bet it’s absolutely delicious. This is one great-looking loaf of bread, Sally. That first picture was truly eye-catching but the subsequent photo showing the loaf sliced couldn’t be more enticing. You really have shared some great breads with us. Thank you! Stunning bread!! How interesting with red wine. Couldn’t it be the alcohol as well? In which case if you heated and reduced the wine you would have less of that to deal with, and just make up the deficit with water… It looks very artistic and adventurous! I might do that indeed…. very good idea! I suspect not the alcohol. As when making wine, yeast is used, yeast converters the sugar to alcohol. Doubt you have to much alcohol in bread to inhibit yeast. the bread sounds fantastic! 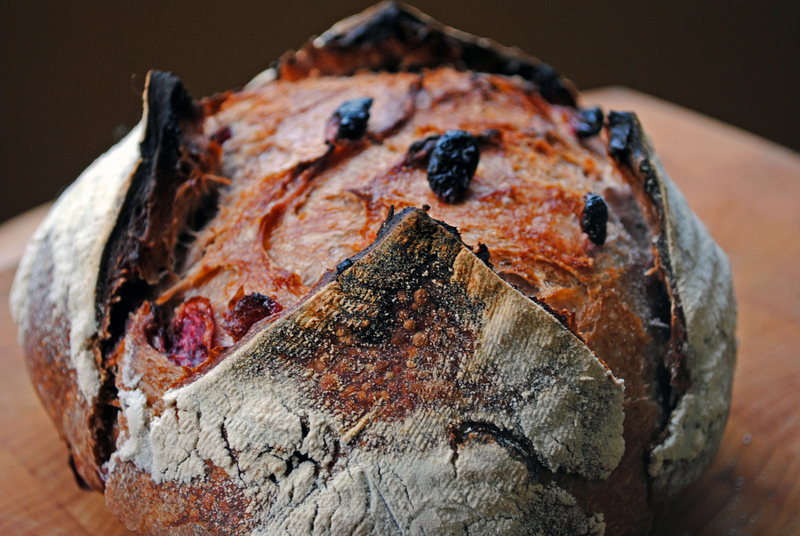 I love that you used wine in the bread and the addition of cranberries is genius! I cannot take credit for it, but agree with you, what a strike of genius! Oh Sally, this is just stunning. I’ve always wanted to bake more with wine, and now I have a lovely new recipe to try. 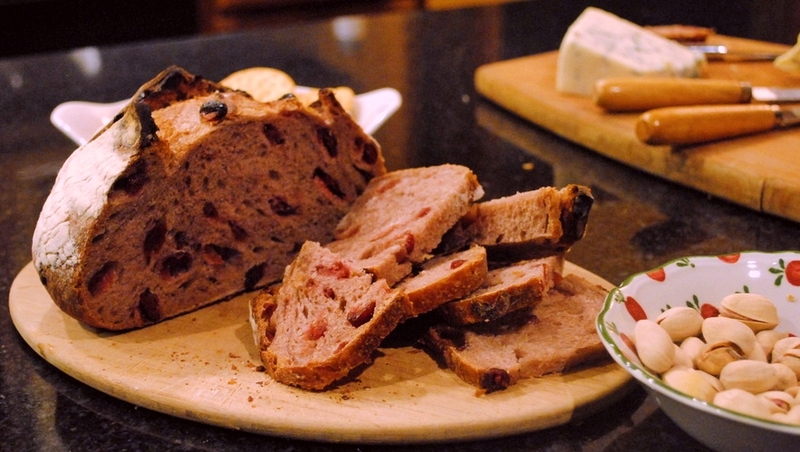 Cranberry walnut bread is one of my favorite recipes, so I’m excited to try something similar. Thank you for sharing…and for all your kind words! what a beautiful and interesting loaf. I recently made one with beer and really thought on using wine. I will give your recipe a try next time. Thanks for sharing and happy baking. Bread baking is always so exciting, don’t you think? I know I’m years behind but I’m curious to know if you tried this again with organic wine and saw a difference? 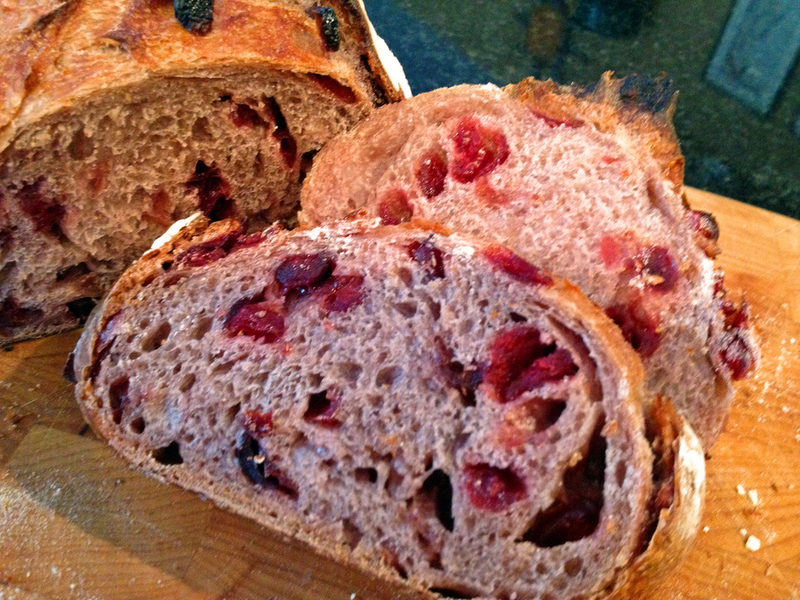 I want to do the same loaf but instead of cranberries, I want to add some saucisson sec. I am embarrassed to admit, that I did not try it again…. shame on me! Love your idea of saucisson sec… my gosh, now I “need” to make it again! the thing is that I quit drinking about a year ago so we buy a lot less wine, in fact my husband even quit the wine club he was part of. But I really should re-visit that issue, quite intriguing…. Ok…so I’m a newbie to this. If baking in a Dutch oven do you take the lid off half way through?